It’s officially fourth of July weekend, which means it’s time for backyard BBQs! Growing up, my family never really had a fourth of July tradition. Every year, we always did something different! Some years we would travel to Maryland and hang out with my cousins, and other years we stayed local and did fireworks with friends. When I turned sixteen, I graduated high school early and left my home town to travel the world and then attend college, so I was never really home for the 4th of July. Since this is my first year back in York, I’m starting my own traditions with Aimery, and decided to celebrate the holiday by hosting a party! The Fourth of July is meant to be a time to relax with family and friends! The kids are out of school, summer is in full swing, and everyone is enjoying the warmth outside. 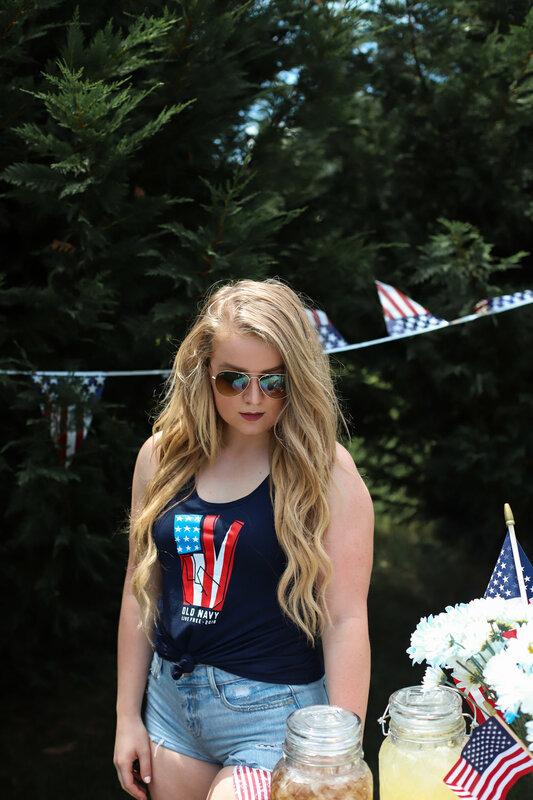 Keep reading for some tips to throw a great 4th of July party that would make the founding fathers proud! Keep decorations simple by going to your local Target's dollar section and picking up red, white, and blue colored utensils and straws! I also was able to score a banner and a 3-pack of American flags to keep things festive! Also don't forget to grab paper plates, napkins, and tablecloth to make for easy clean up when the night is over. Since I'm keeping our party intimate, I decided to bring out these SUPER cute mason jars for our party. I prefer mason jars over table glasses because not only do they give a more "backyard BBQ" feel, but they are less likely to break when dropped by toddlers. For drinks, as much as I would love to have the kind of time where I make sweet tea and lemonade from scratch... I went to my local grocery store and picked up two gallons of each for $10. The kids loved it, and they don't know the difference anyway! For food, we kept it BBQ style with hot dogs, hamburgers, chips, watermelon, and assorted vegetables. The guys were able to talk over the grill while the ladies were able to catch up, and all the kids just ran wild. No one was working hard in the kitchen - it was a fun time for all! Keep clean up to a minimum! By buying paper products, you make your life easier at the end of the party by tossing it all away. I don't know anyone who enjoys doing dishes after a long night of entertainment! Whenever there are kids around - messes are guaranteed to happen! While shopping at Target for your 4th of July needs, don't forget to pick up Brawny® Tear-A-Square™ paper towels! I love having Brawny Tear-A-Square on hand for parties because they have both 1/4 and 1/2 sheets. I never have to feel guilty for using a whole sized paper towel for cleaning up messes like tea spills and ketchup drops. They are perfect for backyard 4th of July BBQs! I hope you all have a great holiday weekend with your family and friends! What are some of your traditions for the 4th of July?